(Finally) Love Quests make the scene, starting with Shirou, Kengo, and Ryouta. Through Love Quests, you can establish relationships between characters. Protagonist's Love Quest only has a battle, no story. Additional details will be added when announced, as always. At the current moment, all that is known is how love relationships are established. 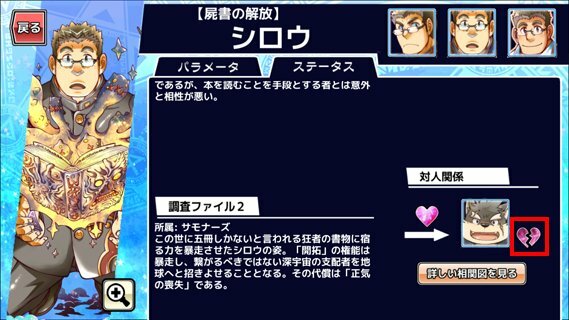 The love connection is determined by the character in your Leader slot (slot 1) and the quest they do. The character in slot 1 will become loved by the selected character Love Quest. For example, with Shirou's Love Quest and Moritaka in slot 1, Shirou will fall in love with Moritaka. However, Moritaka will not fall in love with Shirou. A character can seemingly be loved by any number of other characters. However, a character can only have love FOR one other character. Relations charts will only show four units. The scenarios are not custom-made for every pairing, but there are minor dialog changes depending on the character you use, which depends on their love chart. In Shirou's case, there is a variation in dialog during Shirou's confession scene if you use either Kengo (whom Shirou is disliked by) or the Protagonist (whom Shirou likes). Shirou does not currently dislike anybody, and is not liked by anybody, but it can be assumed that there would be dialog variations during the confession in their case as well. Like Character Quests, there's a Limit Break requirement. You have to reach the third and final Limit Break. In addition, you sometimes have to have done all of that characters Character Quest. Finishing a Love Quest with a character will grant them a heal buff with Affinity Burst if they are next to their loved one in battle. This news update also lists "special voice clips in the My Guild room" as a "feature". If you wish to break up two characters, simply go to their status screen and tap the broken-heart icon. Doing this costs 1 Myosotis. You are given four from the beginning, and with no way to get more at the moment, use these sparingly.